I never heard the term "tuxedo cat" before but I love it! Always dressed for the occasion! All Clymie needs is a little bow tie. 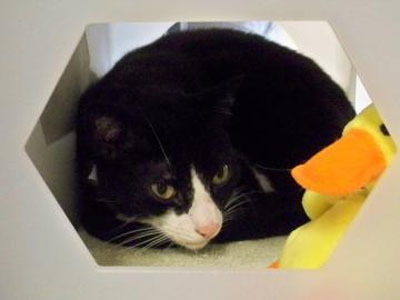 Clymie is a quiet and reserved 8-year-old male black and white tuxedo cat. He weighs about 11 pound. Clymie came to Lollypop Farm because his previous owner was having problems. You’ll most likely find him curled up inside his perch cubicle, but he’ll be sure to come out to say hello if you come for a visit. This super sweet boy has become a staff favorite. He’s a bit scared of strangers at first, but quickly turns into a love bug when showered with attention. Approved adopters over the age of 60 can take Clymie home for free as part of our Seniors-for-Seniors Adoption Program. Please come soon, Clymie isn’t fond of shelter life and can’t wait to curl up in the comfort of his new forever home! Chance, the dog from last week, has been adopted! Toby sounds adorable! You totally should have named him Jeeves!